Above: Just about to reach 3000 metres. 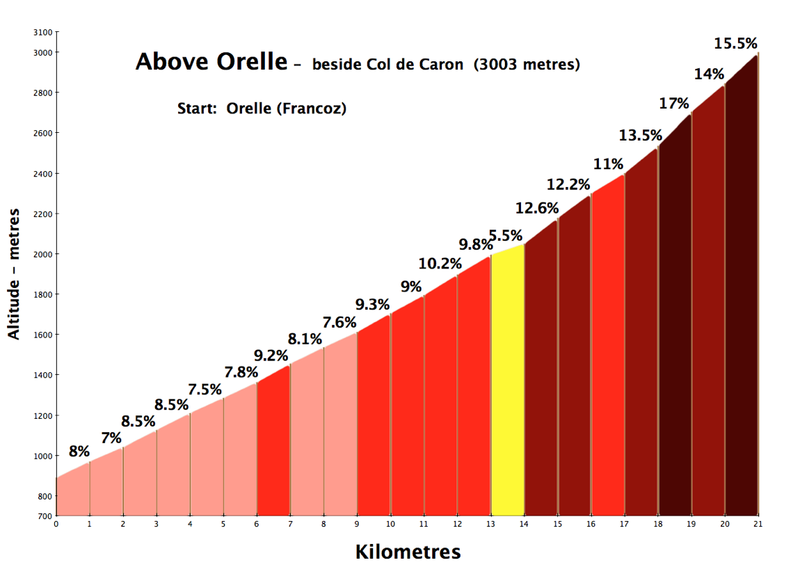 Orelle is in the Maurienne valley not far from the start of Col du Télégraphe and Galibier. It is home to the longest Télécabine in the world that links the village to the Trois Vallées Ski Domain via Val Thorens. 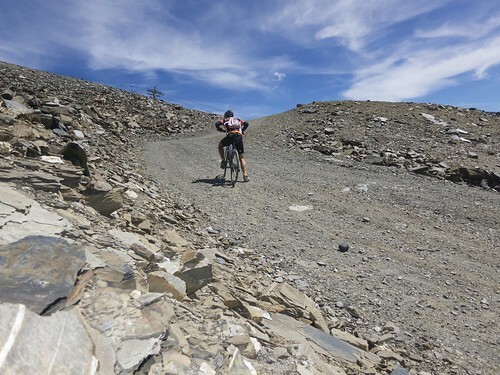 At 2802 metres, Cime de la Bonette was the highest I had ever been on a bike. With the exception of Pico de Veleta in southern Spain, getting above 2800 metres or so means unpaved roads or trails – so I had my hybrid with me. 21 kilometres and 2120 metres of climbing. Wow. The climb starts at the beginning of the above mentioned télécabine. I was surprised to find that only the first four kilometres were paved. 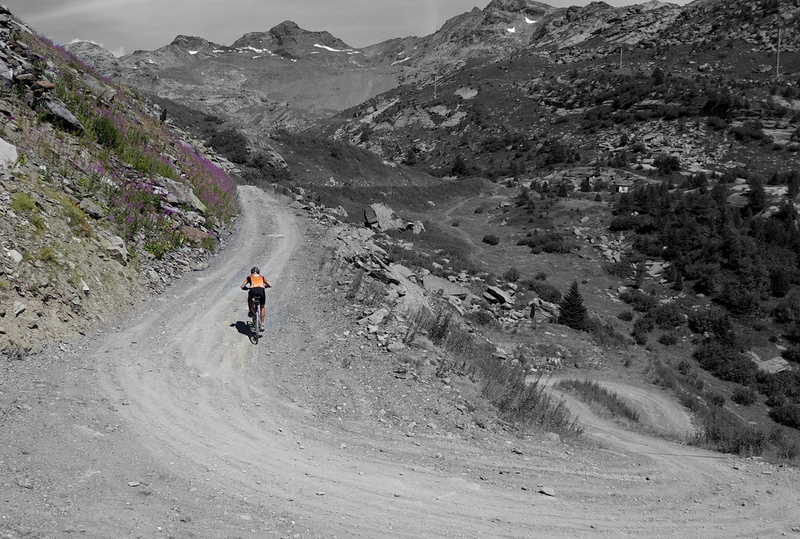 After that it is what I would call a good quality gravel road …. at least until it degenerates into a ski slope near the summit. 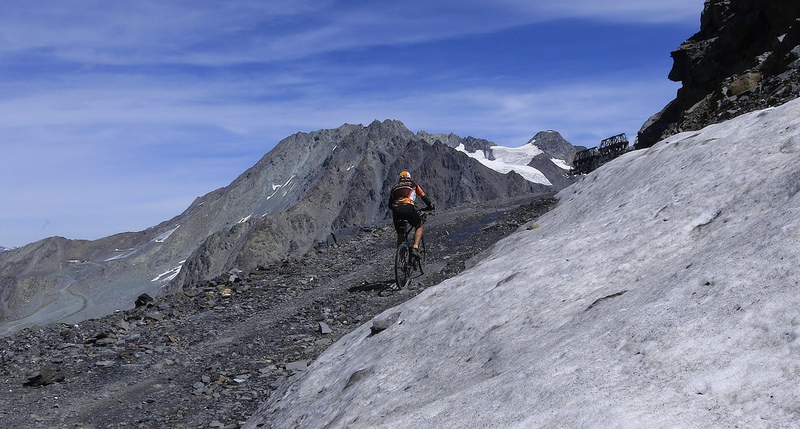 Update: For more climbs above 3000 metres see here. The route roughly follows the line of the télécabine, passing under it now and then. From Arcelin the road rises above the tree line and gets very steep. I was able avoid pushing the bike for most of the way to Plan Bouchet (2344 metres) where the télécabine ends. After Plan Bouchet was brutally tough but incredibly fun. Roughly 4 kms, on very rocky, slippery path / ski piste at occasionally impossible steepness. We’ve skied this slope several times. From Val Thorens …. on the other side of the summit …. this is often the sunniest piste early in the morning during the shorter days of January. I must admit I pushed a lot. But I jumped back on the bike at every opportunity. 12% seemed like false flat luxury. Slowly, but steadily I made progress towards the always visible ski lift cabin at the top. The road summits at Col de Rosael – signed as 3000 metres but actually 2977m. 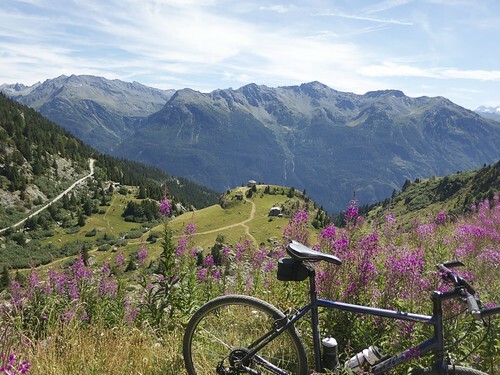 It’s just next to – but not over – Col de Caron (2996 metres). Passing through to the Val Thorens side the road goes up to the top of another télécabine at 3003 metres. WOOOOHOOOO! I explored briefly the ridge passing over Col de la Montée du Fond (2974 metres) (loosely translated, perhaps: Pass of the Climb to the Far End). I relaxed on the ridge taking in all the views in every direction. I was deliriously pleased. The highest I have ever been on a bike. Too good. Wow — what an elevation chart! Frightening to me, fun to you!! Wil, thanks so much for sharing your brave adventures with us. Sitting here in my home in Ontario Canada, I feel as though I am with you on these amazing rides. Great descriptions and incredible photographs. Will, your adventures are always great to read, and provide a lot of inspiration. A couple of weekends ago, I finally did the Orelle to Col de la Montée du Fond route, which has been my goal since I first read your blog over a year ago. I wanted to combine it with a spot of wild camping, so ended up doing the route with a mountain bike loaded down with tent, food, sleeping bag, etc. It was definitely worth it to spend a night up at around 2700m, but the extra kilos made it a killer of a climb. Many thanks for the entertaining reads, and for providing the inspiration to get out and climb those mountains.